On my last trip from Kindu to the Lomami River, I stopped at the little village of Bolaiti perched on a bluff overlooking the river just south of the park. It was here, in March 2011, during our bicycle and walking tour of the Lomami Park that we met Alima, a school girl crippled by polio. She moved across the mud and ruts on her knees to greet us. “She is number one in school”, her Mom told us proudly. We decided then and there to try to do something for her. 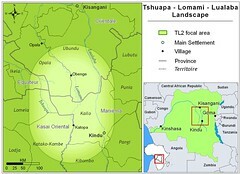 The German Ambassador, Peter Blomeyer, a member of our party, paid for her trip to Kindu on the back of her uncle’s bicycle (40$); a reader of this blog in New York City, Claudia Catania, contributed to make the operation possible (255$). Alima in Kindu, before her surgery. 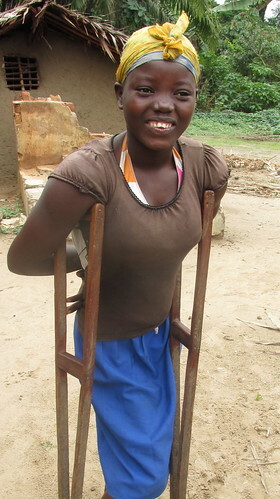 Alima went into surgery on 26 March and 6 weeks later she was upright for the first time in seven years. Now, more than two years later, I stopped again in Bolaiti. Her father greeted me as soon as I pulled over on the motor bike at the family’s home in the center of the village. “How is Alima doing in school?” I asked him. “You can ask her that yourself,” he replied. 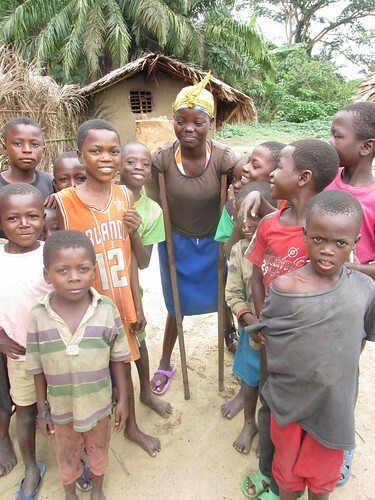 Alima with neighbors in Bolaiti. Alima’s father sent a couple of the gathered children to another house where Alima was helping a family member hull and winnow rice. When she arrived, swinging herself along on her crutches, her face lit up in a smile. “Are you still first in your class,” I asked her? She nodded shyly. “I’d like to go to secondary school next year, “ she answered me after I asked how far along she was in the local school. Her smile stayed with me the rest of the way to Katopa camp. How simple it was to turn a life around; how many more children along these same roads need such simple types of intervention. This entry was written by Terese Hart, posted on 2014-01-11 at 3:36 am, filed under uncategorized. Bookmark the permalink. Follow any comments here with the RSS feed for this post. Post a comment or leave a trackback: Trackback URL.